Bold eyebrows are a hot beauty trend right now. Actress and model Cara Delevingne is getting the credit from fashion writers for this trend, but the look’s popularity isn’t just a passing fad. It’s rooted in biology. Both lay practitioners (cosmetologists) and medical professionals (plastic surgeons) agree on the ideal shape of the youthful female brow, informed by scientific measurements and professional judgement. These identified norms among the population of young women inform our cultural perception of beauty. At age 26, Cara Delevingne has that ideal shape thanks to youth, good DNA, and, likely, a great aesthetician. In the young, attractive woman, the brow should have a certain shape and relation to other facial features. The brow should rest just at the brow bone, which is referred to in medical terms as the supraorbital rim. The brow should begin above the inner corner of the eye and extend slightly beyond the outer edge of the eye. 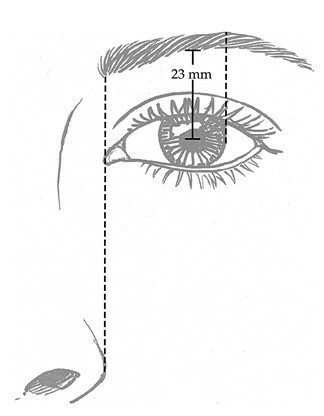 To achieve the perfect arch, the eyebrow should start and end at the same height with the highest point of the arch positioned even with the outer edge of the iris and some 23 ± 3 mm above the midline of the eye. This shape is known in the medical community as an apex lateral slant. The apex lateral slant is the hallmark of a youthful female face. As the face ages, bone recedes and skin loses elasticity. As a result, brows tend to drop and lose the height of their arch. To achieve a more youthful appearance, recreating the apex lateral slant should be the goal of surgery performed to rejuvenate the aging brow. To consult Dr. Yaremchuk about your options for brow surgery, contact him at info@dryaremchuk.com.